Where In The World Is Sammy San Diego? According to The Girlfriend's Guide to Toddlers, I no longer have one. Starting today, Jarrah is four, and that is the cut-off. I'll be sure to remind her of this pertinent fact next time she has a tantrum. In the mean time, I am marveling that I've been doing this motherhood thing for nearly three years. How did that happen? I am working on a special birthday post for my girl, but like so many of my best-laid plans, it's going to have to wait another day. Today, there is birthday cake to decorate, latkes to slather with apple sauce (it's the last day of Hanukkah, too!) and a new experience to be had--Mary, Joy and I are taking Jarrah ice skating for the very first time. Will she love it? Hate it? Cry? Laugh? Cling to the side the whole time? Who can know? And that's the beauty of each day, isn't it, Readers? She is becoming her own little person. All I can do is stand back and watch her glide. And offer my hand if she gets a little wobbly. Jarrah: Okay, what am I? Sam: You are a kid! Jarrah: Not just a kid. Sam: You are an artist! Jarrah: Not just an artist. Sam: You are a dancer! Jarrah: NO. Do you want a hint? Sam: Yes, give me a hint. Sam: That's a great hint. Okay, you are...a ballerina! Jarrah: You are CORRECT! Good job! Yesterday we went to the Firehouse in La Jolla for a performance of Richard Scarry's Busy Town, a teeny, adorable show with children dressed as various animals singing about their career choices. Jarrah, who is an ace theater-goer already, watched in rapt attention throughout, only occasionally shooting me disapproving glances when the girl in front of us did not use her inside voice. "When do we eat that CAKE?" Jarrah: Mama, why didn't we get to eat the pink cake? Sam: The pink cake was pretend, lovey. That's one of the wonderful things about theater. Sam: Well, you know how Mommy is in a play? Sam: You've seen me in the video--I have a husband. But am I really married to him? Jarrah: No. You are married to David. Sam: Right! And the man in the video is John. Is he my husband in real life? Jarrah: Nooooo. He's not your husband. Sam: Right! Just pretend. That's what's fun about the theater. All the pretend. Jarrah: Okay. But why didn't we get to eat that cake? I skim the New Yorker cartoons every week, and usually they just trigger a slight smile, but when I saw this one I laughed out loud. And then I started a giggle fit, which I couldn't shake for half an hour even though I was alone. Every time I looked at the cartoon, I started giggling again. Because it's as if she climbed in my brain at 3:00 a.m., Readers. These are the exact categories I furiously shuffle into the wee hours, and for which I want to kick myself in the morning when I am haggard. 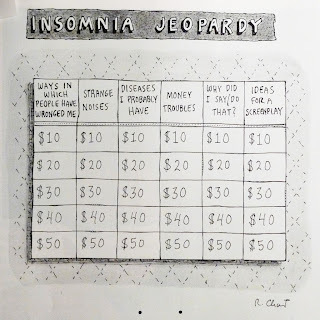 I've always thought Roz Chast was a genius, but this time her insight is downright spooky. Talk amongst yourselves--I'll give you a topic. A quote from Sartre: "Three o'clock is always too late or too early for anything you want to do." Discuss. I haven't actually been a blogging slacker; rather, I've been blogging feverishly and incessantly on my secret drama blog, which you'd know if you'd ever asked for an invitation. The fact is, I'm deep into this theater thing right now, and can think of little else. And not just because I'm busy--because I'm EXHAUSTED. Turns out this dramatic lifestyle is better suited to the young and the retired. The past two weekends, I haven't hit the pillow until 1:00 or 2:00 in the morning, though a certain person who is nearly four isn't much interested in my beauty sleep, and comes a-callin' at 7:00 as usual. It takes me most of the week to recover. And it's not just Friday and Saturday nights--we've been having full-length "brush-up" run-throughs on Thursdays as well. Well, yada yada yada, you might be thinking, and right you are, too. I signed up for this with my eyes open, and despite my kvetching, I'm having a total BLAST. My scene partner, John (who's on his sixth production with the troupe) asked if I would consider coming back for another show, and without hesitation I answered "Just try to stop me." Oh, Lady of the Lights and Greasepaint, your siren call must be answered! "A too-good-to-be-true husband drives his wife nuts with his perfection, until he comes up with the perfect solution. Daffodil (Samantha ___) and her husband Ira (John ___) do a masterful job, hitting every line." Did you catch that, Readers? Catch what, you ask? Oh, just a certain adjective...did it escape your notice? Please allow me to gently guide you back, then. The adjective I'm referring to is MASTERFUL. And no, I haven't met this critic. There was no furtive pay-off in the alley. I just got up there and did my thing (looking like a giant, pink inflatable doll in my vintage costume) and, well, there's just no disguising talent. It outs itself, like a blazing star. I gotta be moi. Okay, I'll stop now. More to follow shortly, in which I beg for your guidance in managing my no-longer-toddler who I think may have been replaced by an alien pod.